"I'm slightly worried about leaving you Jade..Don't do anything stupid while I'm gone..."
Aren't they gorgeous?! They really remind me of the dresses Cheryl wore while she was on X Factor. My favourite is b. and it's only £15.99. Wow. I would just like to say that my thoughts go out to everyone who was affected by 9/11 on this day, ten years ago. I love A. Its gorgeous! I know, they are gorgeous! I can't believe how cheap they all are..
A. is only £13.99 :)..My bank won't be too upset by this haha. 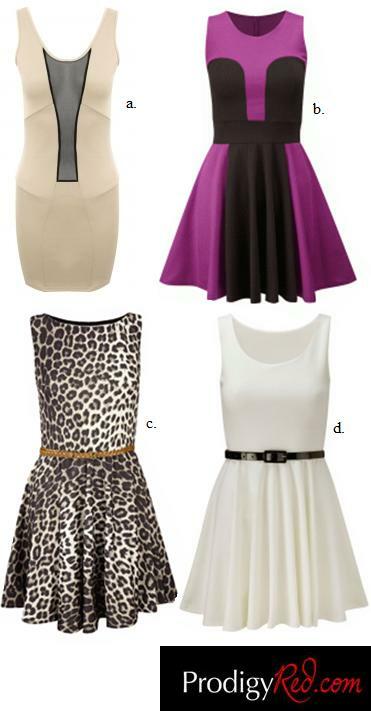 Very nice dresses,b and d are my favorites! I love the purple and black dress just gorgeous! I know, these dresses are amazing! I like that you can dress them up or just wear them casually.